I could not be more excited to announce one of my fall course offerings, The New World in Wool, at the Harrisville, New Hampshire woolen mill this upcoming August. This course is a workshop that will take place from August 16 - 18. 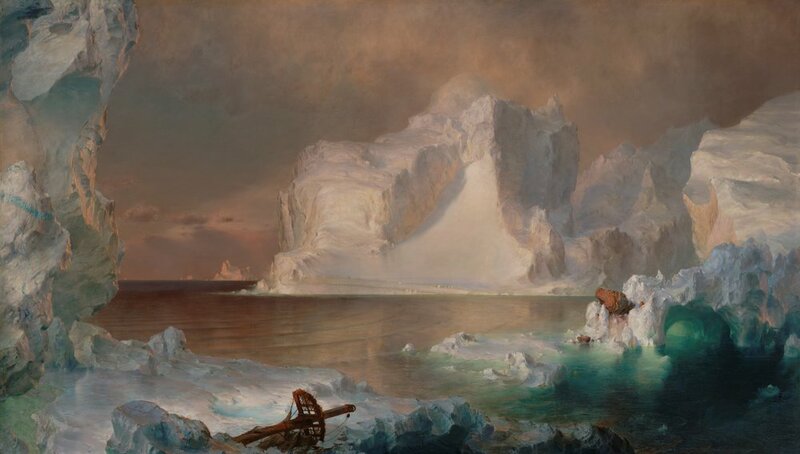 In the mid-19th century, an early American art movement of romantic, epic landscape paintings began that would eventually communicate and document the wild beauty of the New World for generations to come. Artists Thomas Cole, Fredric Edwin Church, and others, captured the essence of the American wilderness, highlighting intense and awe-inspiring landscapes with careful application of color and light. This movement helped create the interest and fervor that drove American settlers West to discover lands rich with natural resources and breathtaking views, but it also drew attention to the Hudson River Valley, where many of the paintings were based. Due to this focus, the movement has been fondly referred to by historians as the ‘Hudson River Valley School’ of painting. Harrisville’s proximity to this area and similar timeline make it the ideal place to explore and rediscover the beauty and inspiration that these art works provide. Hannah will bring knitted and woven samples to show how mixing many semi-neutrals (in the same way as the painters) with a few true colors increases the visual impact of knitted and woven pieces. Students will learn how to look at a painting for inherent palettes, using pre-built samples of palettes constructed by the instructor, from Harrisville’s color-line. Students will learn about the history of the painters and explore their works, while developing their own landscape-inspired color palettes using the wide selection of Harrisville yarns. These color palettes will be used to plan a new knitting or weaving project that captures the beauty of the North American wilderness. I know that Harrisville will be quite the trek for some of you, but the course also includes a tour of the 100 year old spinning mill, among other awesome things! I am so looking forward to teaching this course (and I'm also currently planning some yarn shop and library stop-overs along the way!) You can sign up here.